Let me start with an apology, for the gap in updates — I was out of the country last week, and the rest of the SNOWstorm team was scattered to the four winds as well. Which is a shame, because our second owl from last winter has popped up in cell range — Century, banded in Massachusetts in March by Norman Smith, and last heard from in upstate New York last April. 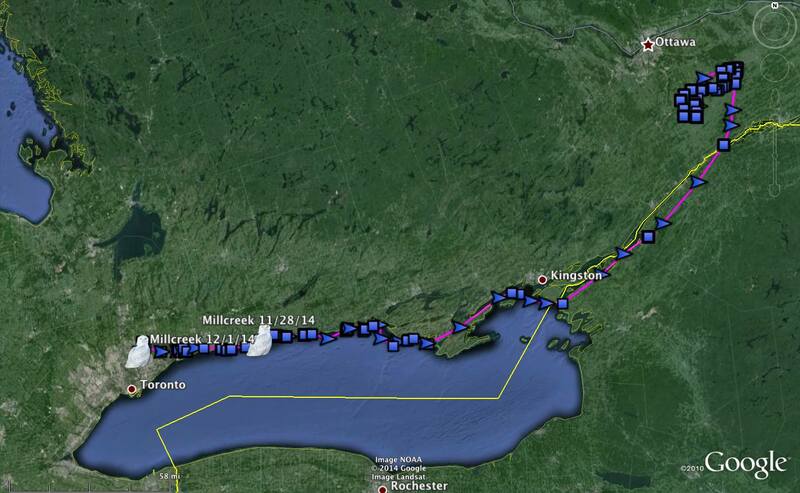 Meanwhile Millcreek, who had returned earlier in November, was continuing his movements through the Great Lakes region. 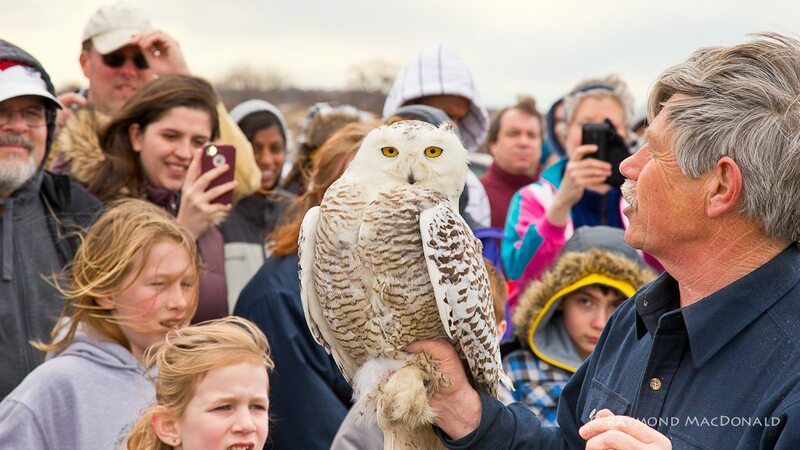 You may recall from last winter that Century was so named because she was the 100th snowy owl that Norman relocated from Boston’s Logan Airport (out of more than 150 he eventually moved last winter). At more than 2,600 grams — almost six pounds — this immature female also was the heaviest snowy that we tagged all winter. Norman released her March 15 in front of a large crowd and a lot of TV cameras at Parker River National Wildlife Refuge near the New Hampshire border. After a few days, she began a huge, looping movement south, west and then north — down through Boston, into northern Rhode Island and Connecticut, and up through western Massachusetts. The first week of April she was moving back and forth between Great Sacandaga and Saratoga lakes in eastern New York. The last we heard from her was April 5, after which we assumed she must have moved north. 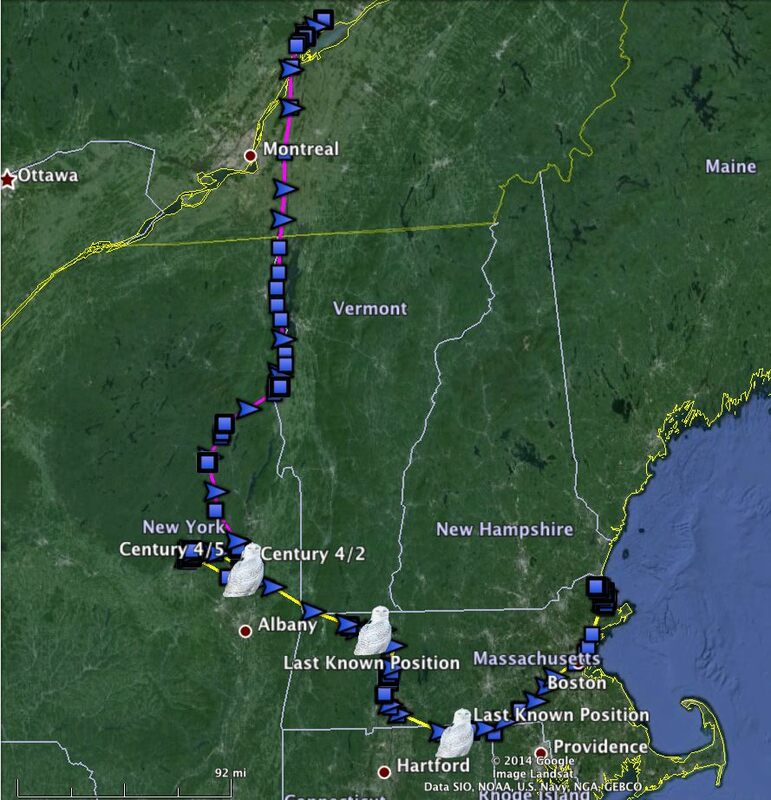 We now know that she had, indeed, begun flying up through the Adirondacks and the Champlain Valley, reaching the St. Lawrence — which is proving to be a popular stop-over site for migrating owls in both spring and fall — by April 11. At that point, the battery in her solar-powered transmitter dipped below its minimum threshold, and it went into hibernation mode, probably because of poor weather and cloud cover. 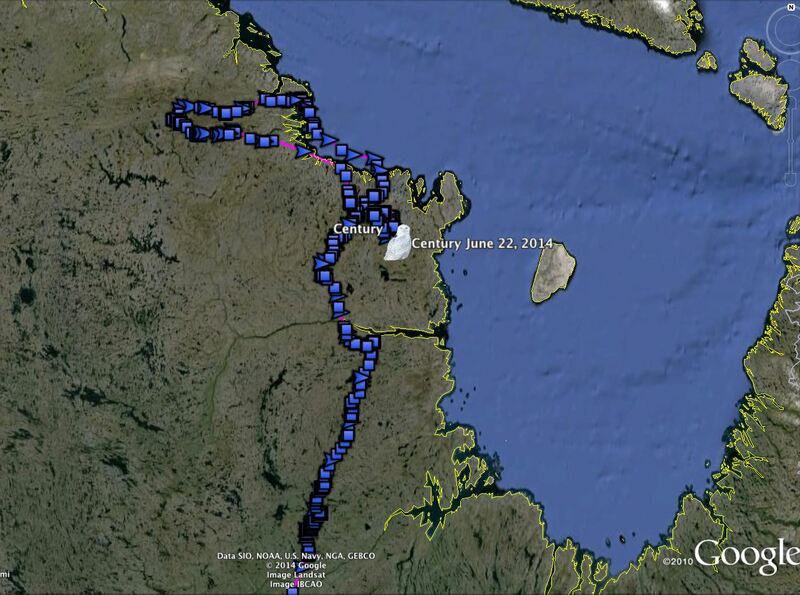 When it resumed operation on May 15, she’d flown 770 miles (1,235 km) north, near the base of the Ungava Peninsula. This first batch of data we’ve received from Century covered the period through June 22, during which she was exploring the northern Ungava along the Hudson Strait near Cap Prince-de-Galles. 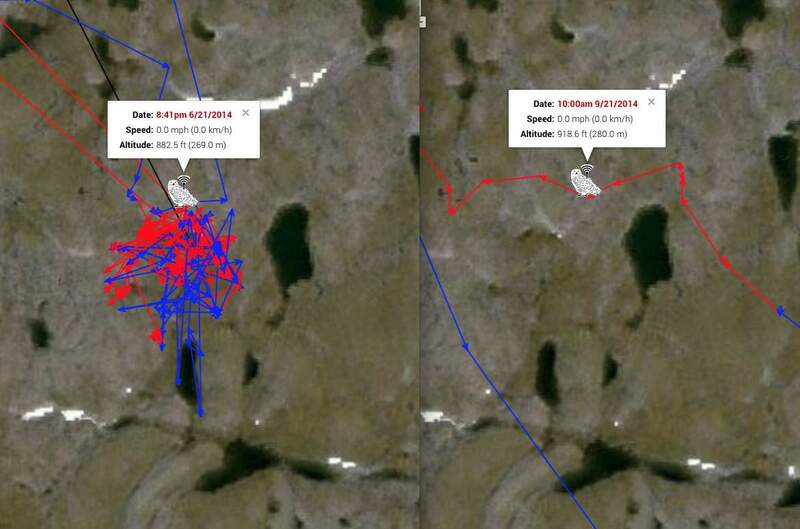 It’s just a bit north of the area where Millcreek spent the summer — and in fact, SNOWstorm webmaster Drew Weber compared their tracks and discovered that, a few months apart, both owls had used roughly the same perch next to the same anonymous little tundra pond as a perch — a perch that obviously must look like an ideal rest spot to a snowy owl. As in the past, you can explore her movements in incredible detail with our interactive maps — and use Google Earth’s Panoramio feature to look at photos from the areas she was using this summer, like the tundra near the Inuit village of Kangiqsujuaq and other areas in this part of Nunavik, as the northern third of Quebec is known. The rest of Century’s adventures will have to wait for another data transmission or two, but we know that on Nov. 30, she was back down here, with a summer’s worth of subarctic wandering stored in her transmitter’s memory. When her unit last checked in via cell network, she was about 50 km (30 miles) northeast of Quebec City, along the south shore of the St. Lawrence near Montmagny. Meanwhile, Millcreek has uploaded all of his data. At the end of November he left the area south of Ottawa where he’d been hanging out, and flew southwest along the St. Lawrence, through the Thousand Islands region and the Prince Edward peninsula, and along the north shore of Lake Ontario. His last location was about 20 km (13 miles) north of Toronto near the town of Markham, Ontario. One feature of the transmitters is a “safety check,” requiring them to phone in on the first of each month. Because the units had checked in on their regular schedule the day before, this second check in 24 hours knocked both of Millcreek’s and Century’s batteries below the transmission threshold of about 3.6v, although they should still be storing up regular GPS locations. This is, in fact, the most challenging time of the year for our solar-powered transmitters. The days are at their shortest, the angle of the sun is very low in the sky, and the weather is often cloudy and snowy (or rainy) for long stretches. But we’ve been learning from our experiences. Because transmitting via cell network is the by far the biggest drain on the battery, we’re moving from a check-in every three days, as we did last winter, to once a week. While that means a somewhat longer wait for data, it should reduce problems with low batteries during the gloomiest days of winter, and gaps in the data. Throughout all of this, we’re watching this winter’s irruption continue to unfold. While not as overwhelming as last winter, the numbers are dramatically above average in much of the East and Midwest, with especially large counts in the Great Lakes — like the 26 snowy owls that suddenly appeared last week in the eastern Upper Peninsula of Michigan. There are also a fair number of snowy owls this winter in the northern Plains, especially North Dakota, and a few sprinkled across the Pacific Northwest. Understandably, all the excitement here at SNOWstorm lately has been about last winter’s owls — but that’s not all that’s going on. We’re about to start tagging fresh birds, so stay tuned in the next few days for all the details about the first members of the Class of 2014-15. 130+ in Wisconsin already this year, compared to 73 by this date last year. Many in nearly identical locations as last. I so hope they make it back to Delaware again this year. Last week an owl showed up in Northumberland County, PA and was seen at the same sites that owls were using last winter. Two already at Port Mahon! Saw one on Gooseberry Island, Westport, Massachusetts. Beautiful !! Many bird watchers there. That is wonderful! What a beautiful owl! the first week of this month, Dec 2014, we saw a beautiful Snowy Owl at Bombay Hook NWR, Delaware! Thanks for the update! 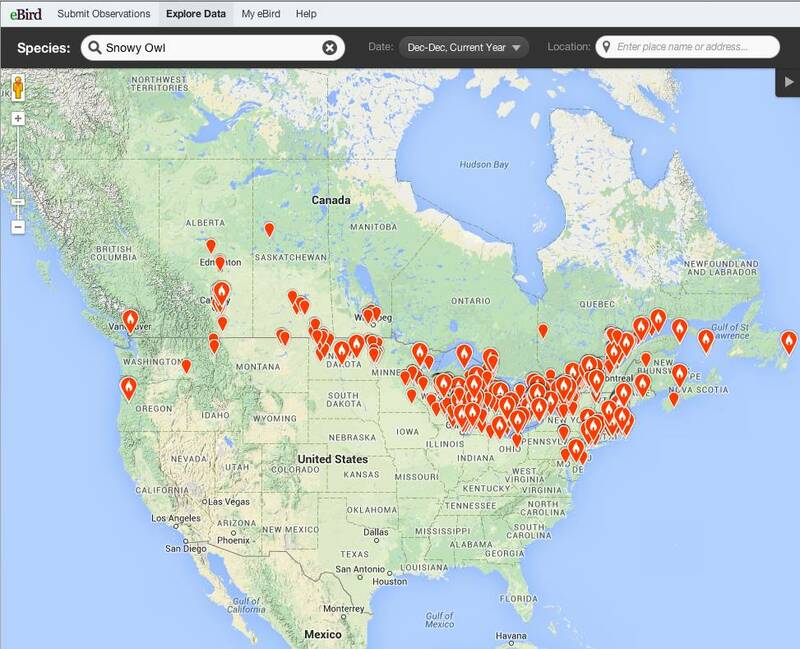 Quite a few snowy owls sightings in Eastern Ontario, mostly the Ottawa Valley. Lots of Snowy sighting in Ontario this year already. saw a snowy on plum island MA its always siittig ontop of an abandoned pink house on the marsh right as you come over the bridge to plum island right before the beach and the sunset bar. seen her for the past 3 years there. ChrisDame Weve seen her there too…for two years now. its a great perch to see stuff scurrying along the ground in all directions I think.